Visitor guide to our premier Trinity Lake boat rentals and jet ski rental vacations. 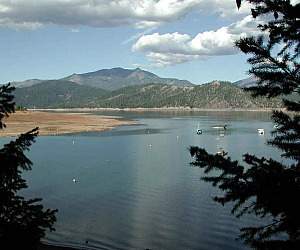 This lake is located 20 miles west of Lake Shasta, this lesser-known Trinity lake is a hidden treasure of amazing wakeboard / water ski boat rentals and tours, jet ski rentals, waverunner rentals, PWC personal watercraft rental, and sea doo rentals. Secluded coves and beaches are ready to be explored; perfect for wakeboard lessons, water ski lessons, or wake surf lessons. Be the first to waterski on the early morning glass or cast your line for a little trout fishing at Trinity Lake. Whatever your passion, Trinity Lake is a great place to enjoy the water. What a great place to rent a houseboat, paddle boards, water trampoline, wakeboard boats, and watercraft from Invert Sports at Trinity Lake. The lake is serviced by several marinas, including Trinity Alps and Estrellita marinas on the south end of the lake, and Trinity Center marina at the north. Most of the marinas rent houseboats to vacationers year round. Trinity Lake, previously called Clair Engle Lake, is a lake on the Trinity river formed by the Trinity Dam, and located in Trinity County, California. The lake has a capacity of 2,447,650 acres, making it one of the largest reservoirs in California. Trinity lake's surface is at an elevation of 2370 feet. This lake is known for its many small arms, glassy inlets great water skiing conditions, and water sport adventures. Offering the best in water recreational activities at these marinas, launch ramps, and resorts around Trinity Lake in California; Trinity Alps Marina, Cedar Stock Marina, Trinity Center Marina.